The photo illustrations in this section represent a 25-year collaboration between Punch & Judy and theatre photographer David Cooper. While credit is always shared, Christina and Scott generally develop concepts; Scott does pencil sketches for client approval and coordinates logistics of photo shoots; Christina does the styling; and David creates the final images. Click any image to see a larger version. 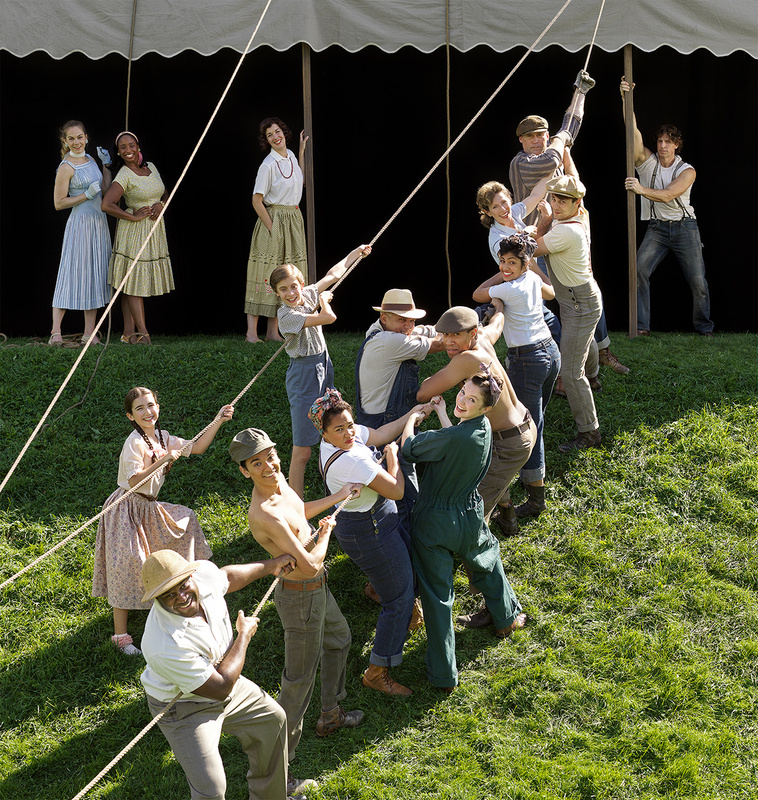 The Stratford Festival’s 2019 season poster image, featuring members of the current acting ensemble, makes reference to an iconic 1953 photograph of workers raising the original tent for the Festival’s inaugural season. 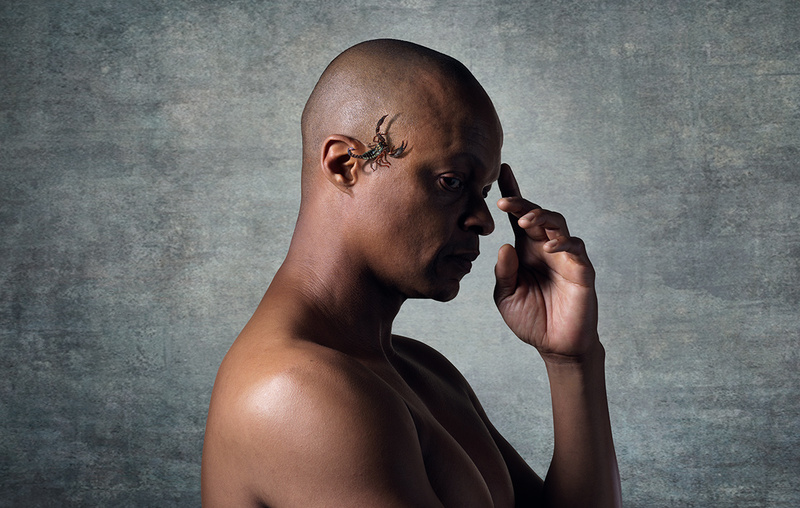 A scorpion crawling out of Michael Blake’s ear conveyed the Moor’s poisoned mind on the poster for Stratford’s 2019 production of Othello. 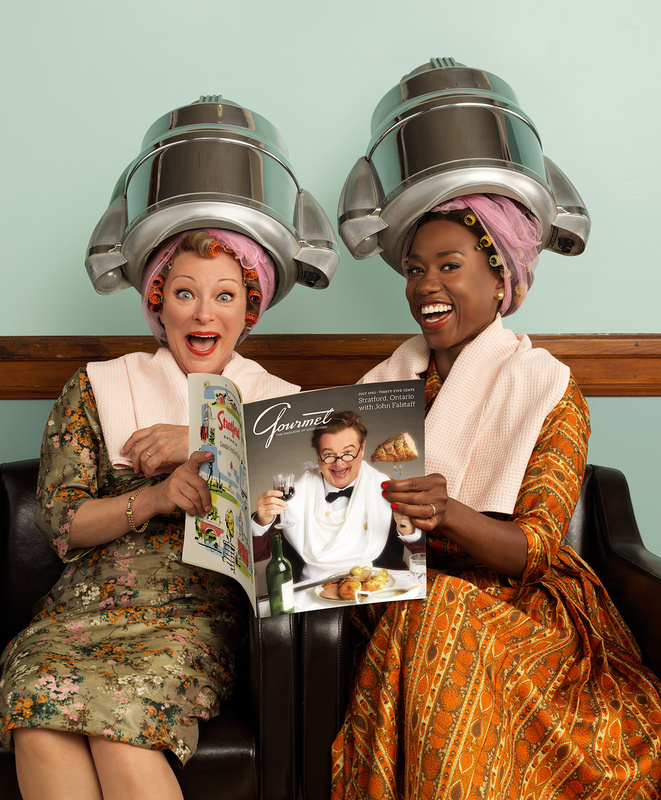 Brigit Wilson and Sophia Walker star in Stratford’s 2019 production of The Merry Wives of Windsor set in 1953 (Geraint Wyn Davies as Falstaff appears on a magazine cover). 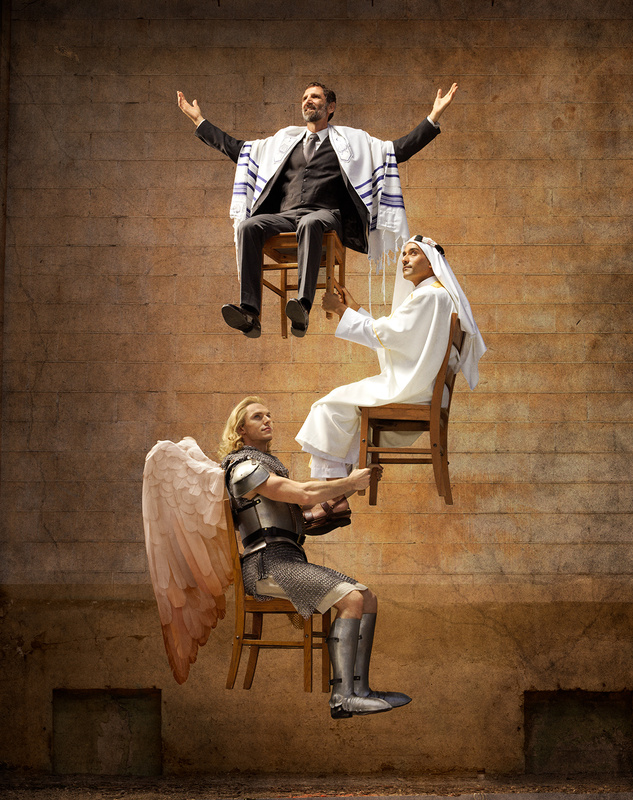 Gotthold Lessing’s 1779 play Nathan the Wise is a plea for religious tolerance set in Jerusalem during the crusades; Scott and David created a three-dimensional Escher puzzle for Stratford’s 2019 poster image. Some posters come with expectations. For Little Shop of Horrors we expect to see a monstrous, hungry plant yelling “FEED ME, Seymour! 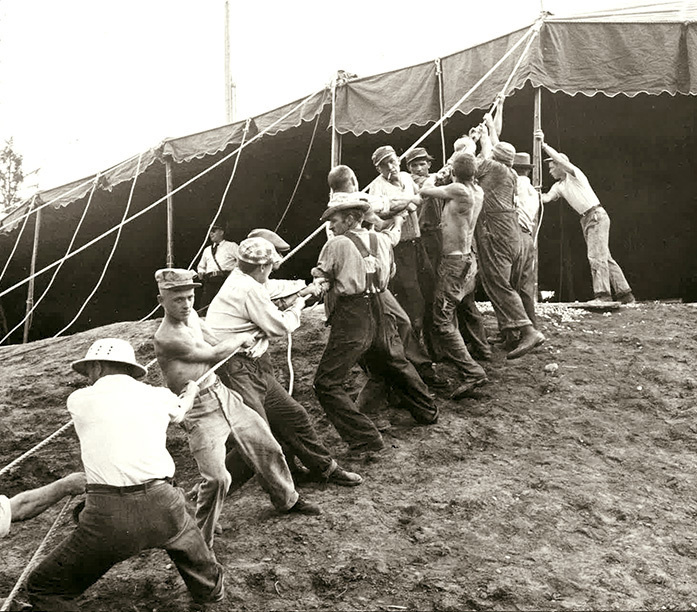 !” But planning for Stratford Festival marketing takes place so far in advance that it’s not possible to show the bloodthirsty creature as it will appear on stage — it had not even been designed yet. 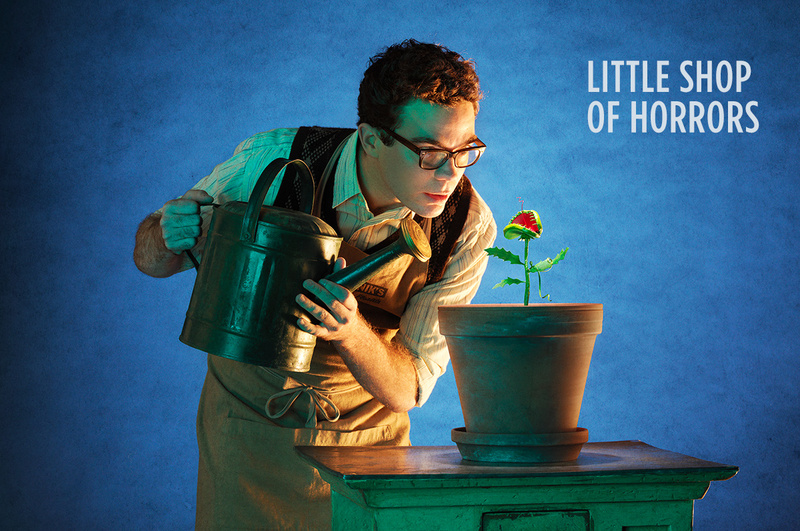 Scott sketched Seymour caring for a tiny, tender plant – we all know what it’s going to turn into when it grows up! — and Heather Ruthing in the Festival prop shop built us a bouncing baby Audrey 2 for the photo shoot. Scott was looking forward to the photo shoot for Billy Elliot to witness the collaboration between Donna Feore, the director and choreographer of Stratford’s brilliant musical productions, and David Cooper, one of North America's great dance photographers. 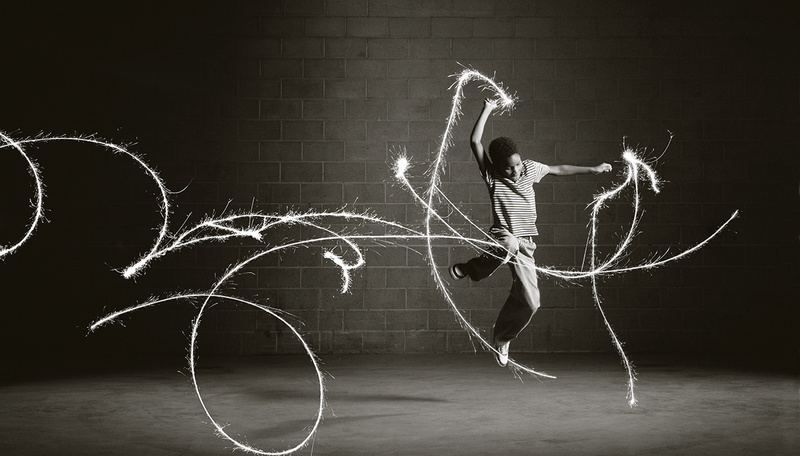 A century-old railway factory in downtown Stratford suggested the industrial environment of Billy's coal mining town in Northern England, and contrasted with the wonderful energy of Nolen Dubuc, the ten-year-old dancer taking on the title role in this production. Wajdi Mouawad’s Birds of a Kind, is performed in English, German, Hebrew and Arabic with projected translation, like the surtitles at an opera performance. The main character is Eitan, a geneticist, who is nearly blown up in a terrorist bombing in Israel. His Jewish family and his Arab girlfriend gather at his bedside in hospital — he is like a Rosetta Stone connecting disparate cultures and religions. 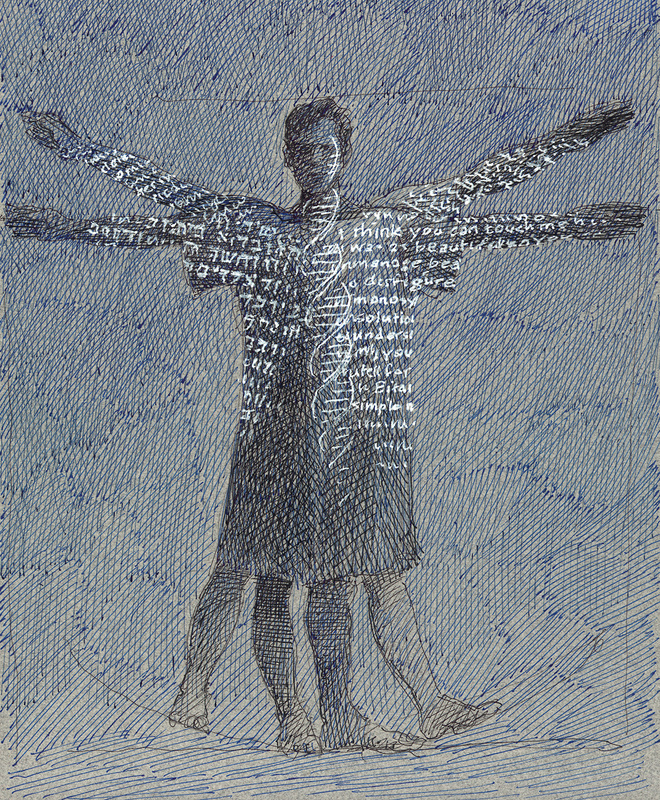 Scott pictured Eitan in the pose of DaVinci's Vitruvian Man with texts in four languages projected on him. Farhang Ghajar was the very patient model. 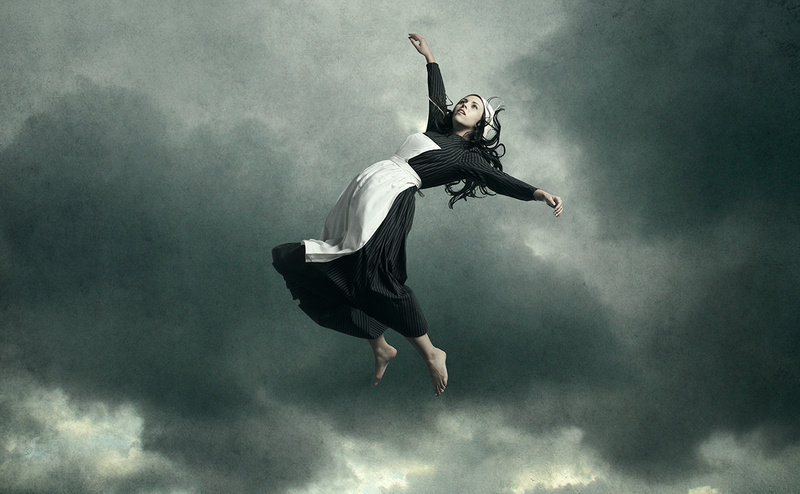 The witchcraft in Arthur Miller’s The Crucible is just girls pretending — or is it? Christina suggested this surreal image; Mariah Campos was our tireless model for the photo shoot. 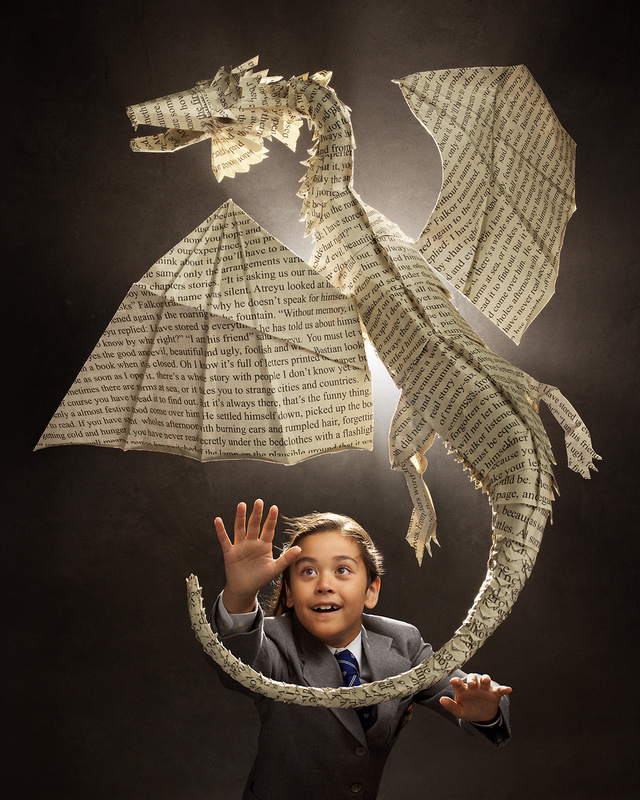 The Stratford Festival’s family show for 2019 is The Neverending Story. 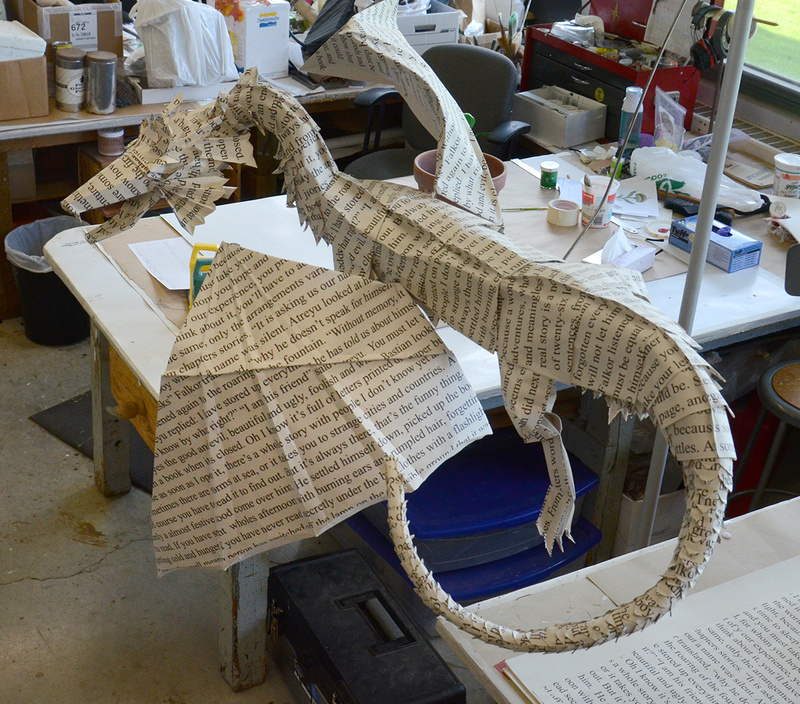 The client’s prerequisite for the poster image was a dragon. It was too preliminary to know exactly how the dragon would be presented on stage, so we needed a visual metaphor that would make clear for the reader that this is a marketing image, not a production photo. 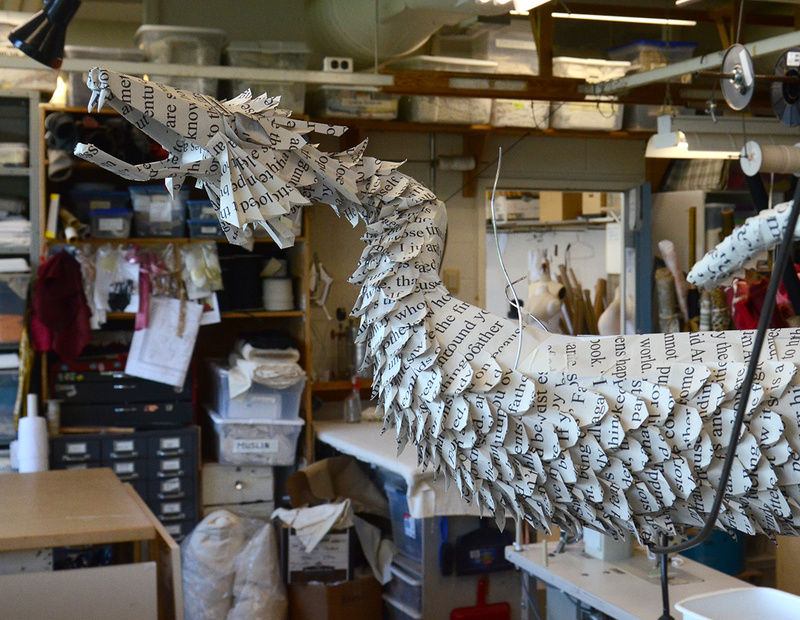 Scott designed a 5-foot origami dragon made from oversize pages of text from Michael Ende’s novel, and Heather Ruthig, one of the Festival’s brilliant prop builders, made the dragon for our photo shoot. 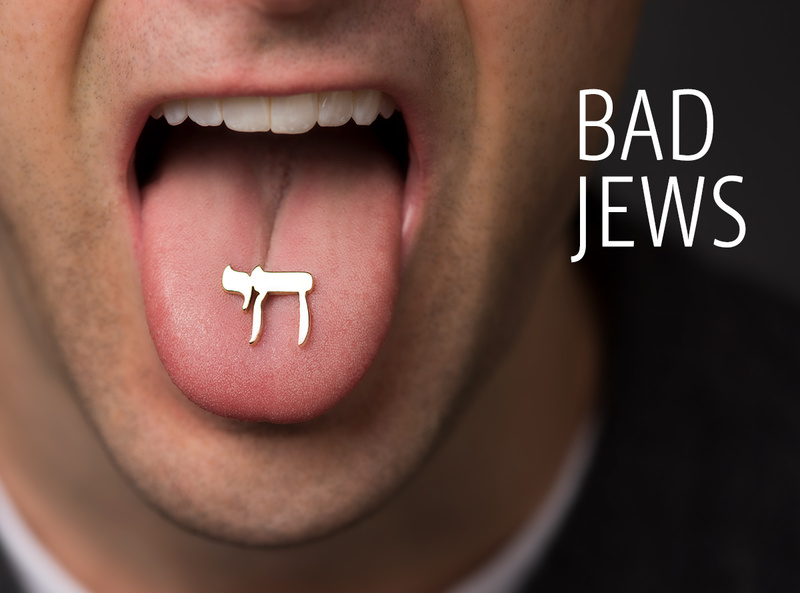 Christina came up with this bold concept for Joshua Harmon’s Bad Jews at Theatre Calgary in 2016. 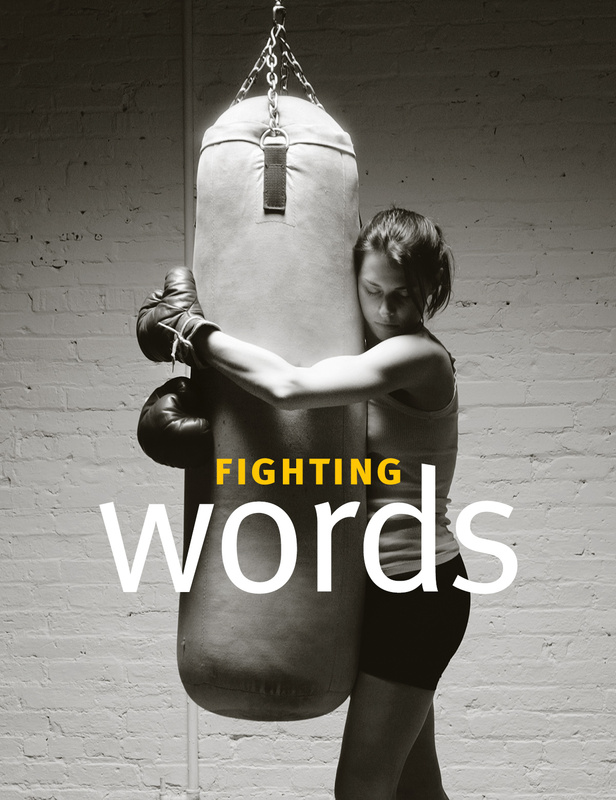 This is a play about words — the characters’ mouths disgorge strongly held opinions, hilarious and ferocious arguments, insults, and outrageous profanity. But the image also refers to the family story of the grandfather keeping his chai safe for two years in a WWII concentration camp by hiding it under his tongue. Gabriel Urist made the jewelry. 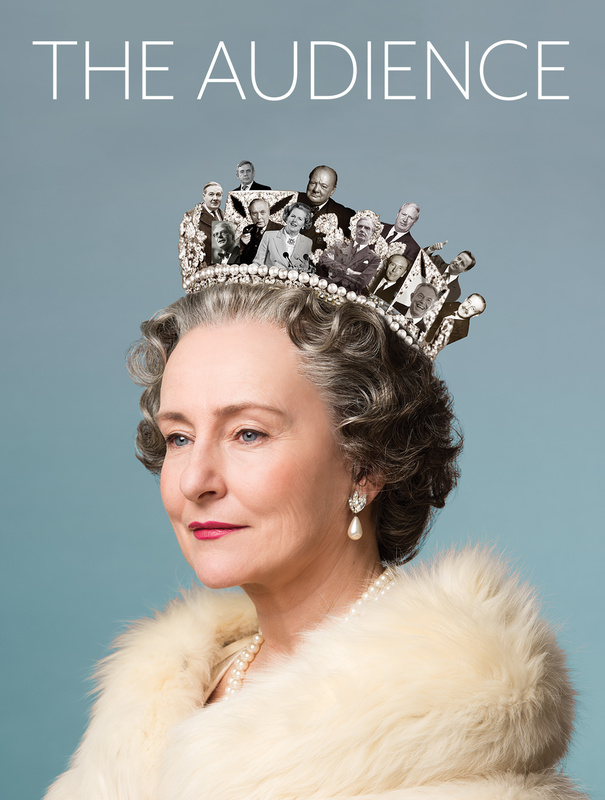 Seana McKenna played Queen Elizabeth II in The Audience at Theatre Calgary in 2017. 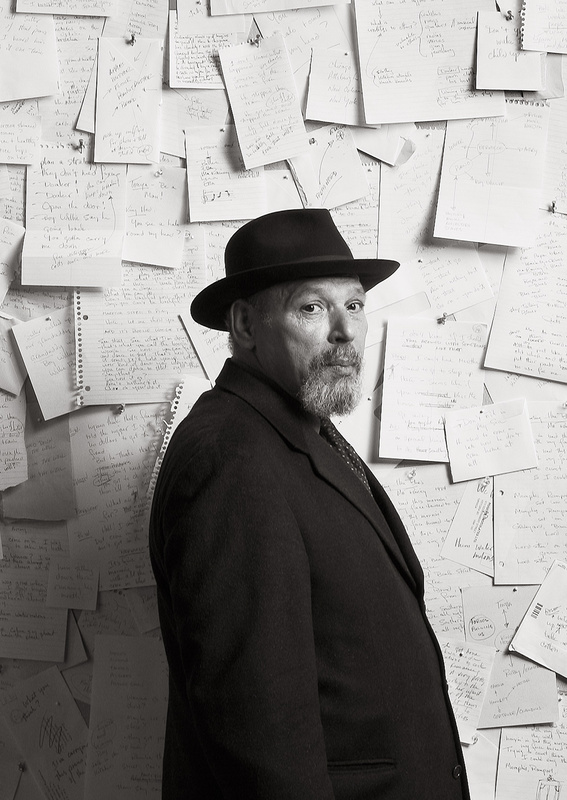 Peter Morgan’s play focusses on the weekly private meetings between the Monarch and her Prime Minister — Elizabeth has had thirteen of them over her long reign. 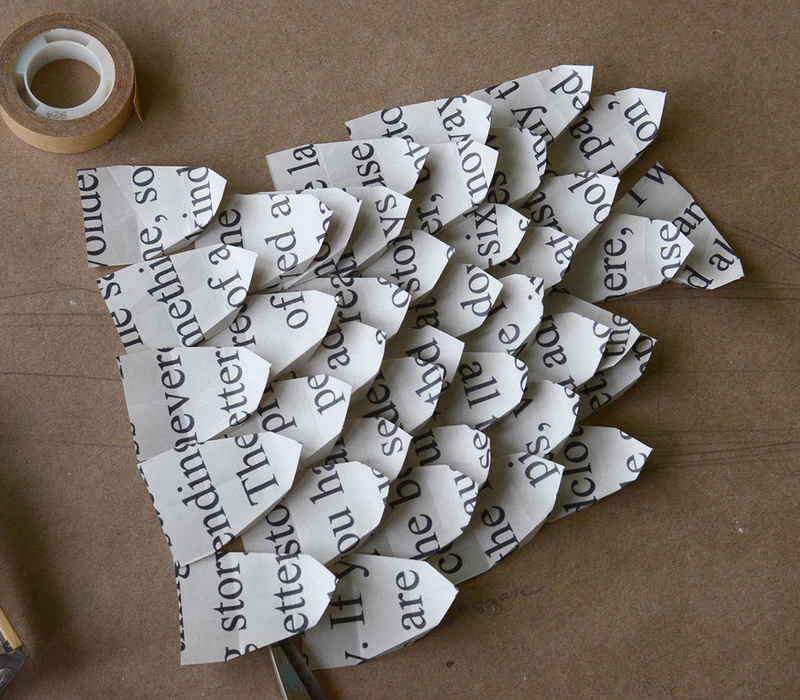 Scott created a collage of these PMs in Elizabeth’s crown. 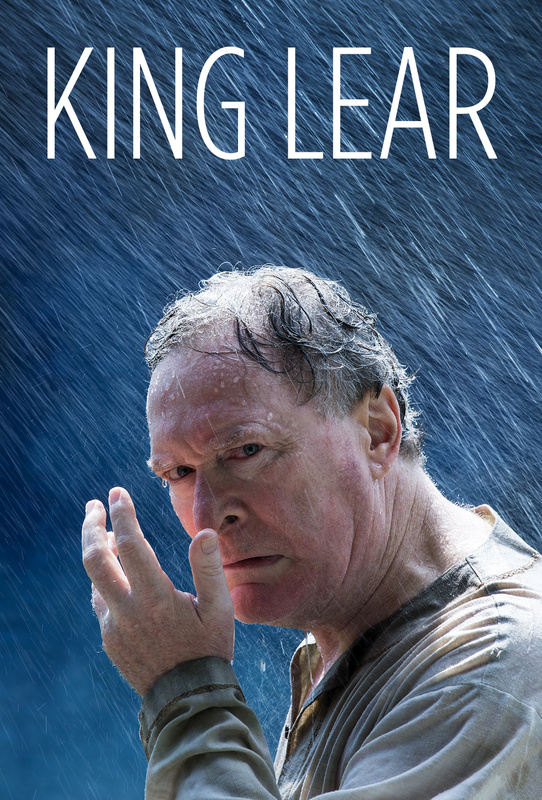 Benedict Campbell played King Lear at Theatre Calgary in 201. Scott and David shot this photo in Niagara-on-the-Lake the previous summer — lit by natural sunlight, with Ben posing, soaked to the skin in a rainstorm created with garden sprayers. 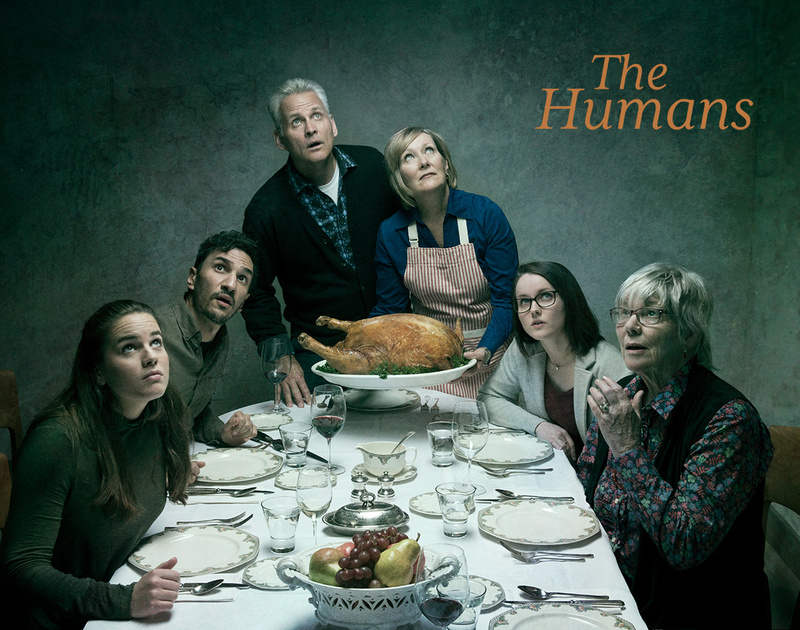 Theatre Calgary presented Stephen Karam’s The Humans in 2018. Scott and Christina had seen the original production in New York and loved the play; their concept for the Calgary image was a dark version of Freedom from Want, Norman Rockwell’s famous illustration of a family Thanksgiving dinner, painted in 1943. 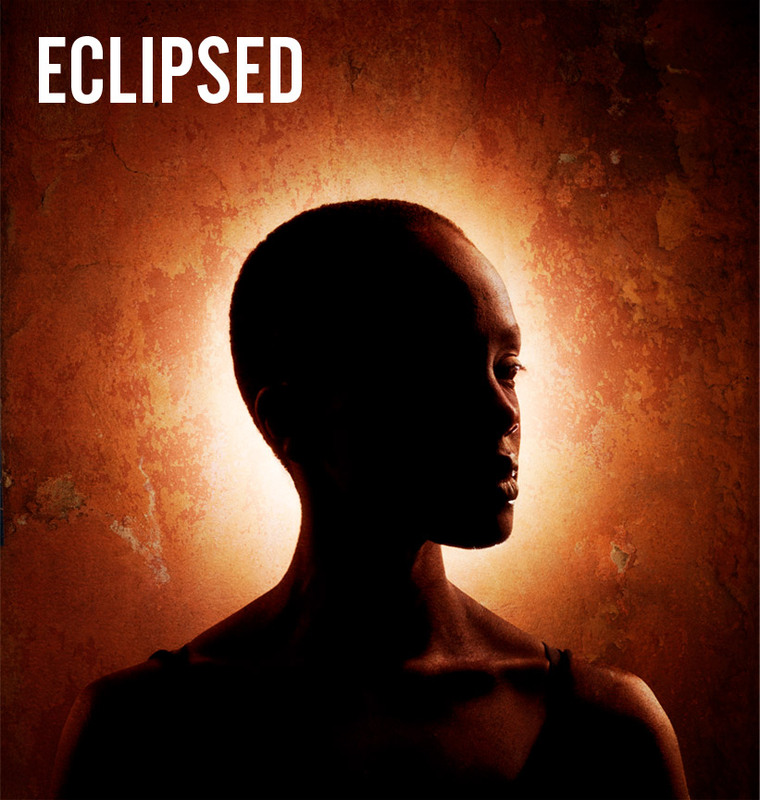 Eclipsed, a play by Danai Gurira, follows the experience of women caught up in the 2003 civil war in Liberia. Gurira explained the significance of the title — the light of her characters' lives is taken away from them by the experience of war, but there's always hope because the light comes back when the eclipse ends. For the 2009 Yale Rep poster image, David created an eclipse in the studio by placing a light source behind the model’s head. The play enjoyed a Broadway run in 2016. TCG published the script that same year and we were thrilled that the playwright requested the Yale image on the cover. 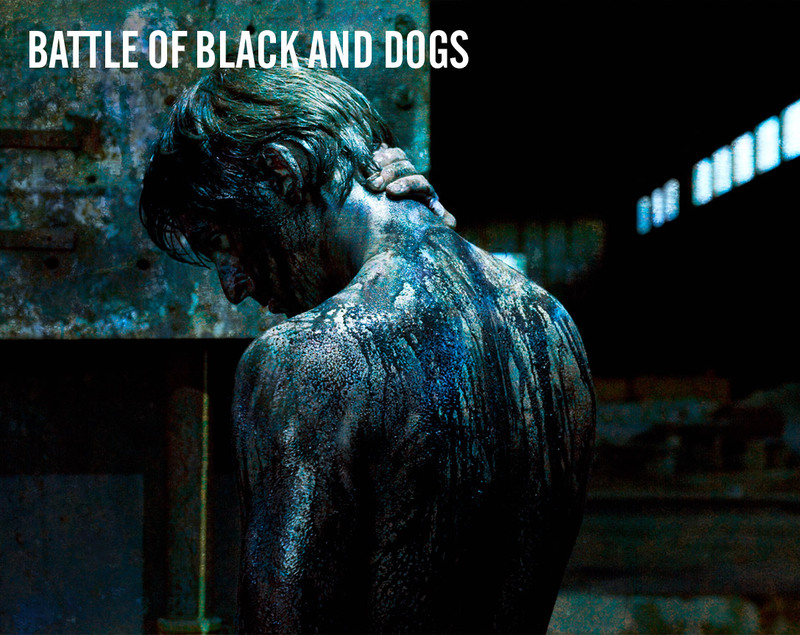 Bernard Marie Koltes' dark play Battle of Black and Dogs is set on a construction site in Africa. Robert Woodruff's direction for this Yale Rep poster image was succinct: "A man covered head to toe in thick viscous black oil so no detail is visible. Lit by floodlights at night. A machine gun if you need a prop. A piece of fence somewhere maybe." We shot the image in an abandoned factory building in Stratford. Welsh boxer Johnny Owen, the “Merthyr Matchstick,” died in 1980 following a bantamweight world championship fight in Los Angeles. Sunil Kuruvilla’s Fighting Words is set in Owen’s Welsh village during the fight. All the men are in California to support their local hero, so the play is a story of three local women, each with a different relationship to Johnny. The image needed to convey the world of boxing – but a sad tenderness as well. Christina’s colleague Dana Osborne was our wonderful model. 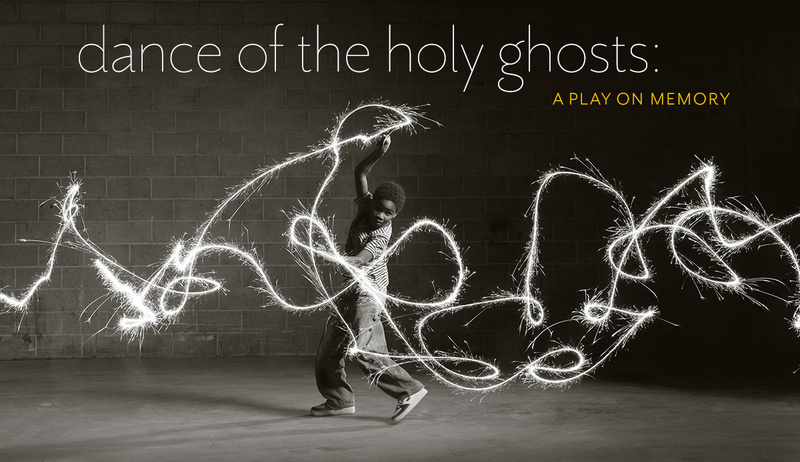 A time exposure of a boy playing with sparklers evoked memories of childhood for the world premiere of Marcus Gardley’s play Dance of the Holy Ghosts. 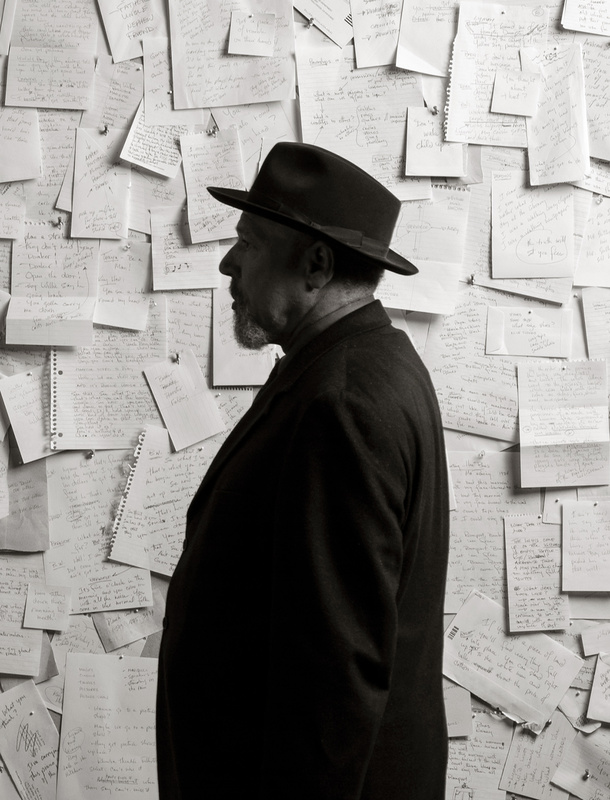 David captured several great compositions — one was used as the poster image for the play, another for the 2005/06 season poster and brochure cover. 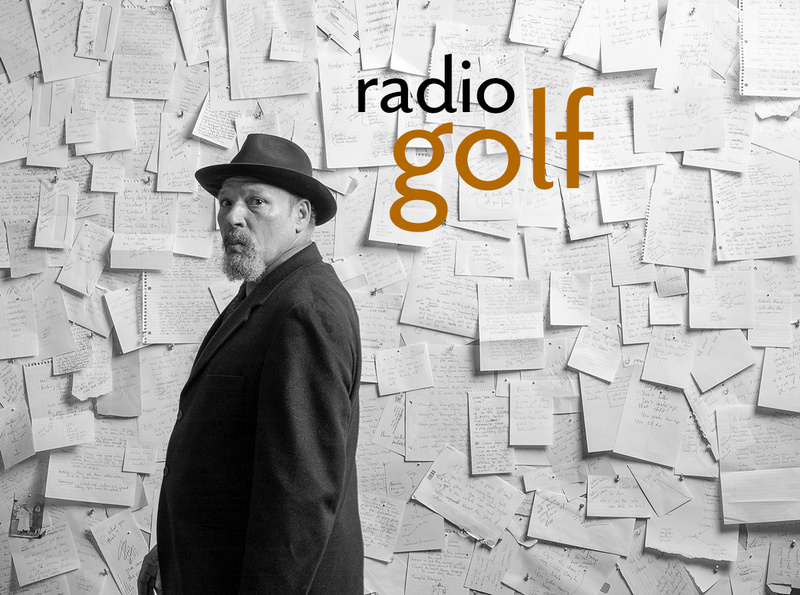 August Wilson completed his epic ten-play cycle about the black experience in America in the 20th-century with the world premiere of Radio Golf at Yale Rep in 2005. 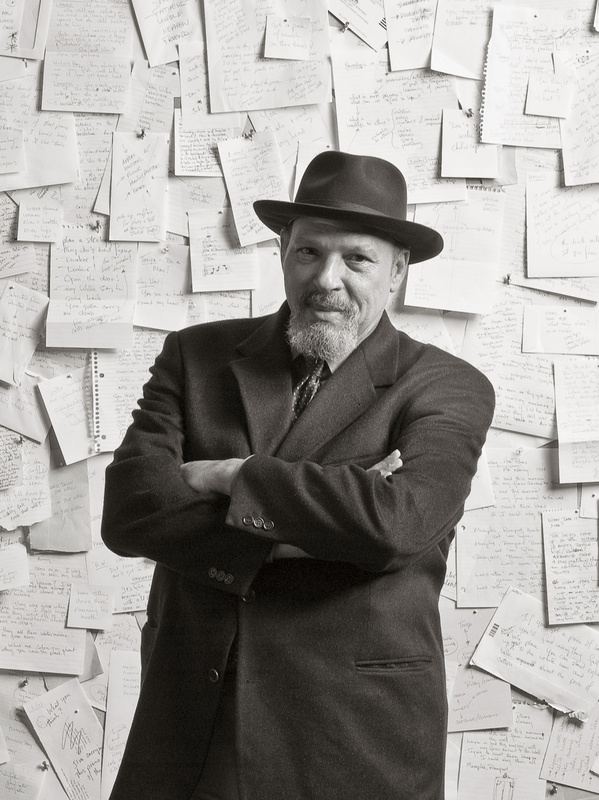 Wilson had always assembled his plays from bits and pieces of dialogue written on scraps of paper – so Scott and Christina created a wall of scraps covered with hand-written lines from his plays. Mr Wilson travelled from his home in Seattle to David Cooper’s Vancouver studio for this photo shoot — three portrait variations are shown below.